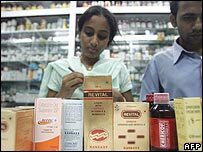 Shares in Ranbaxy, one of India's leading drug companies, have fallen almost 6% after a US court ruled it could not copy a blockbuster drug. Ranbaxy wanted to produce its own version of Pfizer's cholesterol cutting drug Lipitor, which has annual sales of more than $10bn (£5.8bn; 8.3bn euros). Ranbaxy shares, the worst performers in India's main stock index this year, fell 5.9% to 367.35 rupees. Pfizer shares are set to jump when trading starts in New York. The US is the world's largest drug market and firms like Pfizer are fighting hard to protect their market share and recoup the large amounts of cash they have to spend on research and development. Companies like Ranbaxy and Israel's Teva challenge drug patents because they want to get the exclusive right to produce medicines alongside the main manufacturer for a limited period. These agreements usually last for six months and are when generic drug firms make most of their money as prices drop when the medicines can be copied freely. Drugs worth more than $25bn are set to come off patent over the next two years. Ranbaxy has lost a number of these rulings in recent years, and said it would appeal the latest decision. Sanjeev Chiniwar, an analyst at Anand Rathi Securities, said a victory would have been "a great opportunity" for Ranbaxy.